Do you remember good old times when you played soccer wherever you were? You made up goal posts just with a pair of shirts or stones and the game could start. You probably also remember how many times you were arguing with others whether the ball crossed the goal line above the stone or not. Should we awarded the goal or not? These problems could be solved easily with portable soccer goals. Whether you are a soccer mom or unrecognized soccer star, the portable soccer goals can add an extra level to your soccer sessions at the backyard or in the beach or park. There are a lot of portable soccer goals available in the stores. How you should choose the right one for your needs? Let’s go through important parameters you should consider before buying the best portable soccer goals for your backyard. The regular full-size soccer goal is 24 x 8 feet. Official US soccer goal size for youth competitions is 18.5 x 6.5 feet. But I do not know anybody who has a full-size soccer goal in his backyard. It is too big and too easy to score a goal then. Frankly, who plays eleven against eleven with goalkeepers at backyard? And how big should your backyard be to accommodate 22 players? 70 x 110 yards? Not many friends I know have such a big garden. Therefore I recommend smaller soccer goals. 6 x 4 feet or even 4.5 x 3 feet will be just right for your afternoon soccer fun. The exact size of the goal depends on the size of your backyard, and the usual number of players. It is much better to have just small backyard soccer goals when you are playing two on two, or three on three. The posts are made of aluminum, steel or plastic (PVC). Every material has its advantages and disadvantages. Soccer goals with steel posts are most stable. You do not need to attach them to the ground with pins. They will stand upright even in the stronger wind. However, they are too heavy and players risk injury if they hit them. Aluminum and plastic soccer goals are light and easy to handle. They are not as stable as goals with steel posts. You need to attach them to the ground with pins to avoid unwanted shifts during play. Plastic portable soccer goals are usually cheaper. Ease of assembling is an important parameter in choosing the best portable soccer goals for your backyard. Nobody wants to spend half an hour by assembling two soccer goals instead of playing. Pop-up portable soccer goals are the best choice in terms of time. You just take them out of the bag and twist open and your soccer goal is set up. The packing is equally easy. The only negative is, pop-up soccer goals do not have a rectangular shape. Rectangular portable soccer goals are usually packed in few parts. You have to take the posts and put them together. It should not take you much time if you are at least a little bit handy. As I already mentioned, the heavier steel soccer goals are more stable than plastic or aluminum ones. Most portable soccer goals are delivered with pins for attaching to the ground. However, the ground should not be very hard or you will not be able to put pins into it. I prefer to pack the soccer goals after the game. The quality of the bag (in which goals were delivered) is essential for me. If you will let your goals stay put at the backyard for day and night, check if the posts are from the stainless material. The goal net will also deteriorate quicker under permanent weather influence. Do not forget to buy always two portable soccer goals. 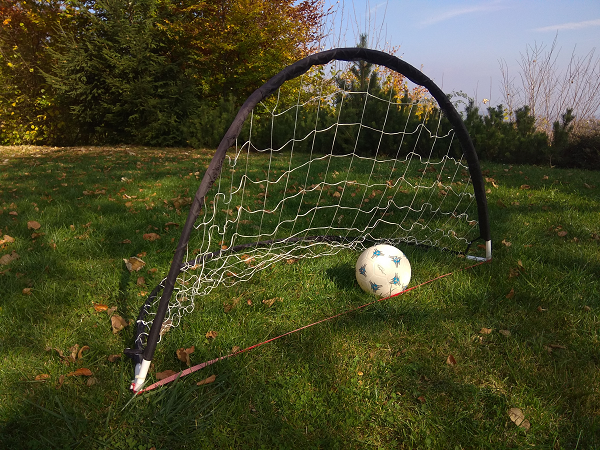 Every soccer afternoon in your garden would be ruined if you find out you have just one soccer goal.